Construction name Ersatz Hagen.Turbine engines were damaged during trials which delyed her delivery date. Pincess Victoria Louis also christened this ship at which Admiral Hans von Koerster spoke. All action times are CETIn the VI Division of the III Squadron, Kaiserin was 2nd ship in the battle group line following the 4 König class of the VI Division. She sailed behind Kaiser and Prinzregent Luitpold. Early problems with her turbine at 16:19 forced her to stop the center shaft although it was repaired before she came into action.At 17:40 Nottingham fired a torpedo at Kaiserin at 16,500 yards which, not surprisingly, was wasted. Initially engaged New Zealand without any success. 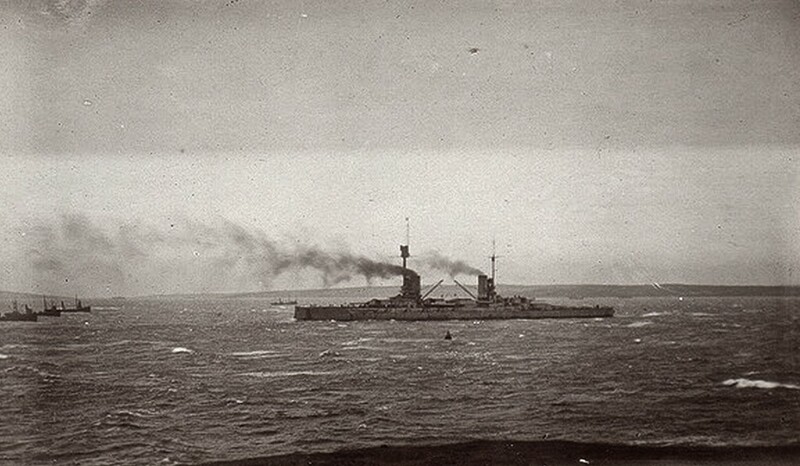 Joined in the shelling of Nestor and Nomad and around 19:00 fired at a four funnelled cruiser without any effect.As Defence and Warrior were being engaged between 19:14 and 19:17, Kaiserin engaged one ship of the British main battle line and landed a hit on the unidentified ship, possibly the Malaya (according to her logs). Fire was then switched to Defence. After Defence blew up at 19:30, she shifted fire to a ship behind her, possibly Tiger, but checked after two salvoes as visibility was so bad. At the 20:10, turn away, nearly collided with the Prinzregent Luitpold. Kaiserin hauled out to starboard to avoid a collision becoming the 7th ship in the line. 3 shaft Parsons turbines with top service rating of 31,000 shp.